For me, life is a journey and in this blog I discuss the tools, beliefs and resources that I have used to make that journey purposeful, peaceful, joyous and prosperous. My journey has been amazing and at times very challenging. As a professional storyteller, I understand the power of story. To share a story is to offer others an opportunity to not only be a witness to your experience but enable them to examine their own journey. Want to be an accomplished artist? 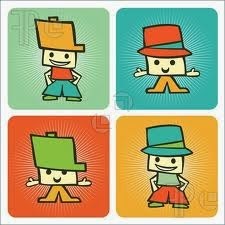 Wear these four hats. Schedule it. We make time for things that we plan to make time for. Put your art making time on your calendar. Go on Artist Dates. Julian Cameron in her brilliant book, The Artist Way, "The Artist Date is a once a week, festive, solo expedition to explore that interest you." Carving out this time fires up your imagination which is what every artist needs to create. Stay abreast of happenings in your industry. Be a part of a community. So often working as an artist can feel very isolating. Be of service. You have to give to get. Share information about what you know best: how you create art. The public loves to hear about how artists do what they do. What inspires you? What is your creative process? Who do you admire in your field? Share these insights on your social media timelines. By sharing, you position yourself as knowledgeable (which you are!) and you become a resource. Publish what you know. (You really do know a great deal!) Even if writing is not your gift, you can publish. For example, if you are a photographer you could publish some of your pictures. If you are a dancer, you could share your audition horror stories. Today there are a plethora of ways to get a byline, such as starting a blog or writing your own e-book. Wear those four hats and you will create a fulfilling creative artist's life. Copyright 2007-2015 TAHIRA Productions, Inc. All rights reserved. Awesome Inc. theme. Theme images by nicodemos. Powered by Blogger.